This Quick Start automatically deploys a highly available IBM Spectrum Scale cluster on the Amazon Web Services (AWS) Cloud, into a configuration of your choice. IBM Spectrum Scale is a high-performance, highly available clustered file system and associated management software, and is available on a variety of platforms. This Quick Start automates the deployment of IBM Spectrum Scale on AWS for users who require highly available access to a shared name space across multiple instances with good performance, without requiring an in-depth knowledge of IBM Spectrum Scale. 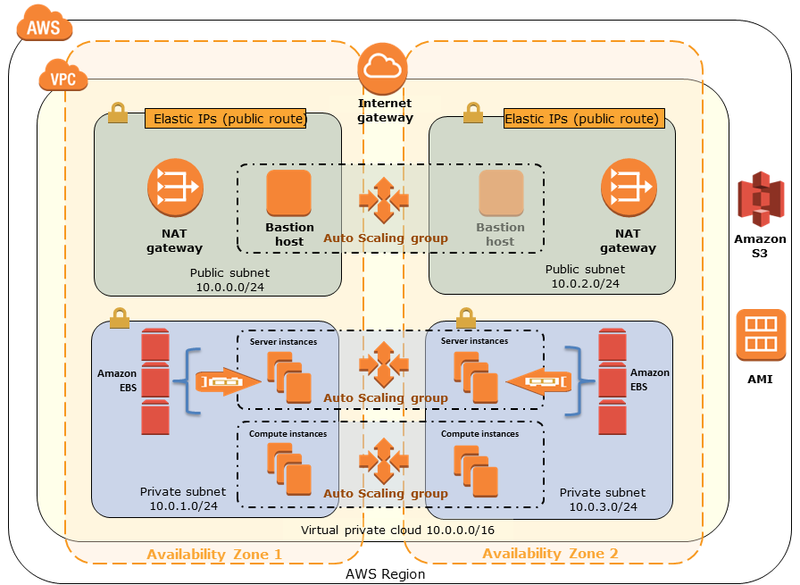 This Quick Start deploys IBM Spectrum Scale into a virtual private cloud (VPC) that spans two Availability Zones in your AWS account. You can build a new VPC for IBM Spectrum Scale, or deploy the software into your existing VPC. The deployment and configuration tasks are automated by AWS CloudFormation templates that you can customize during launch. Appropriate security groups for each instance or function to restrict access to only necessary protocols and ports. The Quick Start opens only ports for SSH and the IBM Spectrum Scale Daemon. Amazon Elastic Compute Cloud (Amazon EC2) instances for each logical role in the IBM Spectrum Scale deployment, in Auto Scaling groups. These consist of IBM Network Shared Disk (NSD) storage server instances and IBM Spectrum Scale compute instances. Review IBM Spectrum Scale trial license terms. Connect to the IBM Spectrum Scale cluster. Test the deployment using IBM Spectrum Scale commands. During deployment, you can configure AWS infrastructure components as well as IBM Spectrum Scale server node and compute node settings. The Quick Start builds the IBM Spectrum Scale environment by using a pre-built Amazon Machine Image (AMI) with IBM Spectrum Scale installed on the Red Hat Enterprise Linux (RHEL) version 7.2 operating system. At this time, you must accept a trial license version of IBM Spectrum Scale’s Data Management Edition (with the limitations described in the deployment guide) in order to be able to use the deployment solution enabled by the Quick Start. The use of IBM Spectrum Scale on AWS (including all packages provided via the Quick Start offering, and packages derived from these) is only intended to be used for a maximum of 90 days, and is not intended for production use. IBM may decide to de-authorize access to the code, and the use of this code, at any time. After the trial period, you are responsible for acquiring the necessary licenses directly from IBM to use IBM Spectrum Scale. The IBM Spectrum Scale evaluations page will be updated with details on how to proceed with acquiring an IBM Spectrum Scale license after the 90-day trial expires. You are responsible for the cost of the AWS services used while running this Quick Start reference deployment. There is no additional cost for using the Quick Start. The AWS CloudFormation template for this Quick Start includes configuration parameters that you can customize. Some of these settings, such as instance type, will affect the cost of deployment. For cost estimates, see the pricing pages for each AWS service you will be using. Prices are subject to change. When estimating costs using the pricing pages for AWS services, note that reading and writing data to an IBM Spectrum Scale file system typically causes data to be sent between instances in different Availability Zones, which will result in per-GiB data transfer charges. Although you can avoid such Availability Zone charges by deploying IBM Spectrum Scale resources into a single Availability Zone, you should carefully consider the loss of high availability associated with this approach.